Solution: Part location was solved by designing clamp jaws that are dedicated to each tube configuration. They “lock” in the tube, so that the critical dimension from the profile to the end of the tube is consistently maintained. The amount of material removal and the subsequent chip generation is controlled through the use of servo spindle feed control. Each end is independently machined to its exact length and a “peck” feed motion controls the amount of material removal per spindle revolution. All of these design features also allow for a diameter and length changeover time of under five minutes. Results: Innovation and proper use of available technologies, enables Haven to offer solutions for a wide variety of applications. Haven’s flexibility, both mechanically and electronically, demonstrates the breadth and depth of our capabilities. 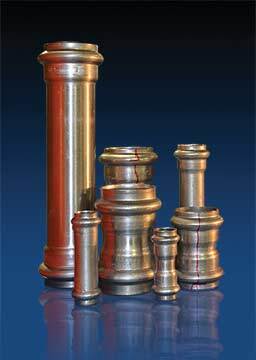 Haven is a full service, turnkey supplier to the tube processing industry.